A small tool able to carry anywhere. Expertise in using tools help train your child to repair various objects. Suitable for a gift on a special days. Strong, Innovative Open-Frame Design Strong yet lightweight, the Suspension Multi-Plier offers the durability of stainless steel construction along with an aluminum butterfly-opening handle that's inspired by the precision engineering of Portland, Oregon's famous suspension bridges. Like those time-tested iron bridges, this tool is designed to deliver the down-and-dirty performance that you demand from your tools. But performance isn't everything. The tool's unique suspension-style handle sits comfortably in your hand, giving it a well-balanced feel. Compact enough to satisfy the most demanding minimalists, and cool enough for any gadget guy or girl, the Suspension Multi-Plier offers a sleek, streamlined design that will look as good as it performs. 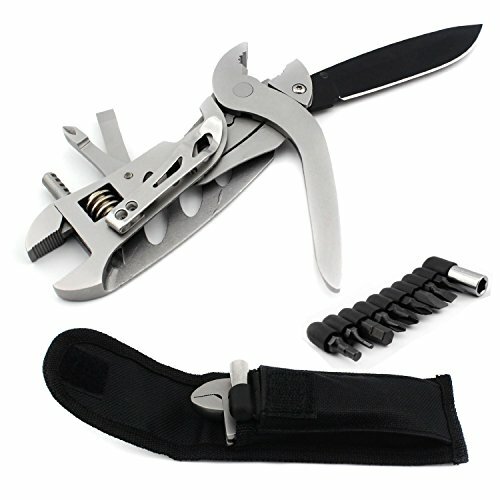 Suspension multitool and nylon sheath. If you have any questions about this product by DZT, contact us by completing and submitting the form below. If you are looking for a specif part number, please include it with your message.